Mars Geologically Active - Solar System Planets And Moons Section. Mars is still geologically active. Researchers have discovered evidence of recent glacier movements and volcanic eruptions on Mars, overturning the long-held opinion that it's a cold, dead world. As recently as 350,000 years ago, glaciers moved from Mars' poles to its tropics, covering the planet in sheets of ice. 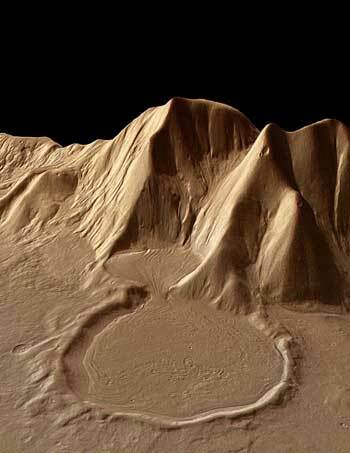 And several of Mars' giant volcanoes were active as recently as 2 million years ago. The heat from these volcanoes could sustain microbial life in underground pools of liquid water. Shifting glaciers and exploding volcanoes aren’t confined to Mars’ distant past, according two new reports in the journal Nature. Glaciers moved from the poles to the tropics 350,000 to 4 million years ago, depositing massive amounts of ice at the base of mountains and volcanoes in the eastern Hellas region near the planet’s equator, based on a report by a team of scientists analyzing images from the Mars Express mission. scientists also studied images of glacial remnants on the western side of Olympus Mons, the largest Volcano in the solar system. They found additional evidence of recent ice formation and movement on these tropical mountain glaciers, similar to ones on Mount Kilimanjaro in Africa. In a second report, the international team reveals previously unknown traces of a major eruption of Hecates Tholus less than 350,000 million years ago. In a depression on the volcano, researchers found glacial deposits estimated to be 5 to 24 million years old. James Head, professor of geological sciences at Brown University and an author on the nature papers, said the glacial data suggests recent Climate change in Mars’ 4.6-billion-year history. The team also concludes that Mars is in an "interglacial" period. As the planet tilts closer to the sun, ice deposited in lower latitudes will vaporize, changing the face of the Red planet yet again. Discovery of the explosive eruption of Hecates Tholus provides more evidence of recent Mars rumblings. In December, members of the same research team revealed that calderas on five major Mars volcanoes were repeatedly active as little as 2 million years ago. The volcanoes, scientists speculated, may even be active today. "Mars is very dynamic," said Head, lead author of one of the nature reports. "We see that the Climate change and geological forces that drive evolution on Earth are happening there." Head is part of a 33-institution team analyzing images from Mars Express, launched in June 2003 by the European Space Agency. The High Resolution Stereo Camera, or HRSC, on board the orbiter is producing 3-D images of the planet’s surface. These sharp, panoramic, full-color pictures provided fodder for a third nature report. In it, the team offers evidence of a frozen body of water, about the size and depth of the North Sea, in southern Elysium. A plethora of ice and active volcanoes could provide the water and heat needed to sustain basic life forms on Mars. Fresh data from Mars Express – and the announcement that live bacteria were found in a 30,000-year-old chunk of Alaskan ice – is fueling discussion about the possibility of past, even present, life on Mars. In a poll taken at a European Space Agency conference last month, 75 percent of scientists believe bacteria once existed on Mars and 25 percent believe it might still survive there. Head recently traveled to Antarctica to study glaciers, including bacteria that can withstand the continent’s dry, cold conditions. The average temperature on Mars is estimated to be 67 degrees below freezing. Similar temperatures are clocked in Antarctica’s frigid interior. "We’re now seeing geological characteristics on Mars that could be related to life," Head said. "But we’re a long way from knowing that life does indeed exist. The glacial deposits we studied would be accessible for sampling in future space missions. If we had ice to study, we would know a lot more about Climate change on Mars and whether life is a possibility there." The European Space Agency, the German Aerospace Center and the Freie Universitaet in Berlin built and flew the HRSC and processed data from the camera. The National Aeronautics and Space Administration (NASA) supported Head’s work.